Thanks to England’s Sonisphere Festival next summer, Iron Maiden and Metallica will be playing a British festival together for the very first time. It’s fantastic news for fans, as well as Knebworth’s installation of the festival, which hopes to return to international glory after taking a two-year hiatus. Since the Sonisphere Festival was founded in 2009, such legendary names of rock and metal as Slayer, Megadeth and Alice Cooper have taken the stage, not to mention both Iron Maiden and Metallica, who have both headlined before. What began as a run of festivals, taking place at six venues in the UK, expanded quickly over the years to more than ten venues, and was expected to include a 3-day festival at Sonisphere Knebworth, in Knebworth Park, in 2012. A few months prior to the event, which was set to include Queen + Adam Lambert, KISS and Faith No More as headliners, the festival was cancelled, with coordinators announcing its organization was much more difficult than expected. Five other European cities still sponsored Sonisphere that year, and a few kept it going in 2013, but Knebworth ended up taking two years off. Now it seems they intend to make up for that, with the alignment of two of the biggest names in heavy metal. It will also be the 40th Anniversary of the first concert held at Knebworth, and so the event has been extended to three days again, to be held July 4th-6th. Information on tickets and camping, as well as updates on bands performing, can be found on the Sonisphere website. 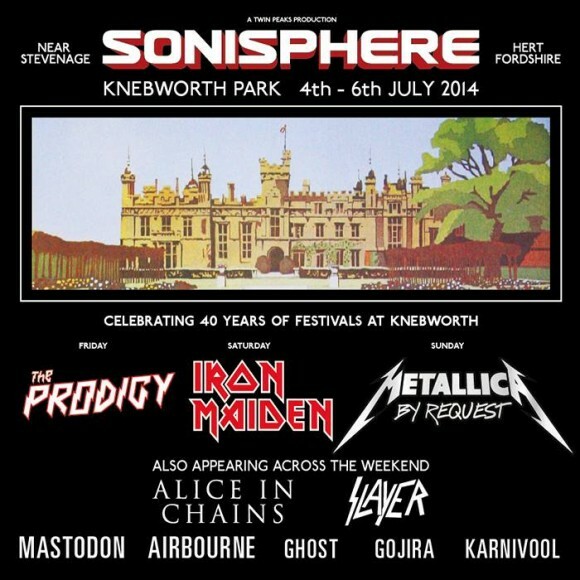 UPDATE 12/13: Rounding out the headlining acts for Sonisphere 2014 will be English electronic noise makers The Prodigy. According to a release from NME, founding band member Liam Howlett promises they’ll be playing new tracks, from their upcoming album, at the fest.